I love the cpo symphonies set, but to be honest I don't listen to this music very closely, I just wallow in it. For a more challenging set of PCs, try Tcherepnin on Bis. But the Milhaud symphonies I heard, from the CPO set, are dull. Just sayin'. I find all the symphonies very beautiful, and they always give pleasure. There are so many of them, though, that the works seem to have little individuality. That may be a flaw in the listener. Of all of Milhaud's symphonies, my favorite is still the 6th. Outside of this symphony, they all run together and start to sound like the next. I used to enjoy these works, but I suppose musical tastes change. I just don't hear much individualism in a lot of Milhaud's music. I also quite enjoy the 6th (as I mentioned a couple of weeks ago in this same thread), but don't know all the symphonies as to comment on your impression of sameness along the whole set. I agree that Milhaud's Syms. are "dull", but, in the "good way"! I agree with who said they just wallow in them; I think that's what they're for. I like all the ones on the two DG discs (1-2, 6-7) and the Erato disc (4 & . Really, I wouldn't need more from Milhaud, though I'd like to hear the 10th. Still, if everyone likes the 6th, what more do you want? And I think this is perhaps the general problem with composers whose oeuvre reached way past 300. A composer who is as prolific as Milhaud, Martinu, and Villa-Lobos were bound to repeat themselves, but surprisingly I get less of this from Martinu and Villa-Lobos than from Milhaud. I do think, however, that Milhaud's strong point is his concertante works. I think this pushed him into different directions. But all of these composers wrote in what I'd probably call a 'stream-of-consciousness' style. I don't think Martinu ever went back to any of his scores and revised them and I think the same could be said of Milhaud and Villa-Lobos. But, in the end, it all comes down to the whose music you prefer and are moved by. I agree that Milhaud's Syms. are "dull", but, in the "good way"! I agree with who said they just wallow in them; I think that's what they're for. I think you've got it. Though I'd say unmemorable rather than dull. I don't need music to be memorable to enjoy it while I'm listening to it, if it has other things going for it. Who knows, with enough exposure I may start to remember. I like all the ones on the two DG discs (1-2, 6-7) and the Erato disc (4 & . Really, I wouldn't need more from Milhaud, though I'd like to hear the 10th. Still, if everyone likes the 6th, what more do you want? The CPO cycle is beautifully recorded. Together with Milhaud's lovely orchestration, that's part of the wallow. But I don't have any other recordings to compare. This set has definitely flown under my radar on more than a few occasions and once I found this deal on Presto, I couldn't refuse. Does anyone else own this set? What do you think of the performances? Thanks for the feedback, ritter. I'm sure I'll find enjoyment in the set. I like Milhaud's "eh" just fine. SOMEONE'S got to procure the 'Boring' sound- Milhaud does it the best, along with Villa-Lobos ('Boring' not subjective term!!). When it comes to the Symphonies, may I recommend the two Plasson DGs (1-2, 6-7), the Erato disc (4, , and maybe the CPO disc of 10-12? Surely I do this every year? The Erato disc of Piano Concertos 2 & 4, or the Ultima 2CD, and that cool VoxBox can round out a tiny but great Milhaud starter. Did anyone pick up a copy of the new Naxos recording of Milhaud 's l'osterie? If so, what do you think? Isn't osterie an Italian restaurant? Re Orestie: Perfectly deccent and even better as performance and recoirding of what must be a tough work to perform and an even tougher work to listen to! Mihaud's music is often very tasty, as in a Provençal "osterie"/osteria... but the Orestie reeks of blood , sweat and tears (at least it should). I'm working my way through this monstrously massive score that, after almost 90-100 years still manages to disturb. The Naxos recording is a brave (and very welcome) undertaking, but , allow me to say ( inspite of the efforts), "not French enough". Still, there's no doubt about the integrity of the undertaking (thanks go to William Bolcom). This colossal work would be a huge challenge for any professional orchestra and chorus. And for the soloists. The vocal range - esp. for the sopranos - can be extremely high and taxing, over very long stretches. The role of Athena, in Les Euménides, is sung by three singers (sop.,mezzo, alto) and is cruelly taxing. Anyway, to my ears this performance gives Milhaud lovers a great opportunity to hear l'Orestie complete and in a very committed performance. In 1988 Reinbert de Leeuw conducted the complete Orestie in Amsterdam, with a superb chorus and a very good Choéphore : Anne Fournet. I witnessed that very impressive performance. Among the soloists: soprano: June Card, sop.Viorica Cortez , bar; Charles van Tassel, Anne Fournet as "récitante"/a Choéphore, sop. Maria Oran, alto Ans Van dam etc. Dutch Radio SO , Groot Omroepkoor en het Koor van de Nederlandse Opera. More recently in Lille and Paris , Jean Claude Casadesus performed les Choéphores with actress Nicole Garcia as reciter. Casadesus should do a complete recording... his performance was really excellent. I listened to l'Orestie in 2 big chuncks - Agamemnon + les Choéphores and, all in one go, Les Euménides. 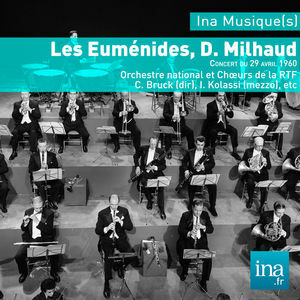 and , a day later to milhaud"s second violinconcerto in this 1967 recording. I'll let it sink down for a couple of days. Since I like a lot of works by Milhaud , I'm propably not the best judge. Still: I was carried away on this screaming, shuddering & motoristic Titanic. My neighbours were not at home. Some stuff was available elsewhere (the Markevitch Choéphores, Le Malheurs d'Orphée, the three opéras-minute, Christophe Colomb--the latter long OOP), but other things I hand't seen anywhere (Maximilien, Bolívar). Looks like a good complement to the Erato bix of earleer this year. I've just ordered it from amazon.fr. 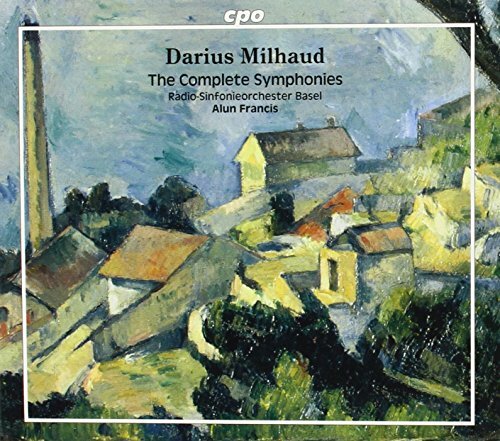 For the first time, I listened to the Milhaud 5th, 6th and 10th Symphonies. These are beautiful and exciting works and sound nothing like the Milhaud I grew to disdain during my student years. I see a lot of indifference in the Milhaud thread here. I can't argue. But after stumbling upon the 5,6,10 and 11 on Spotify I have to say, I'm a post Op. 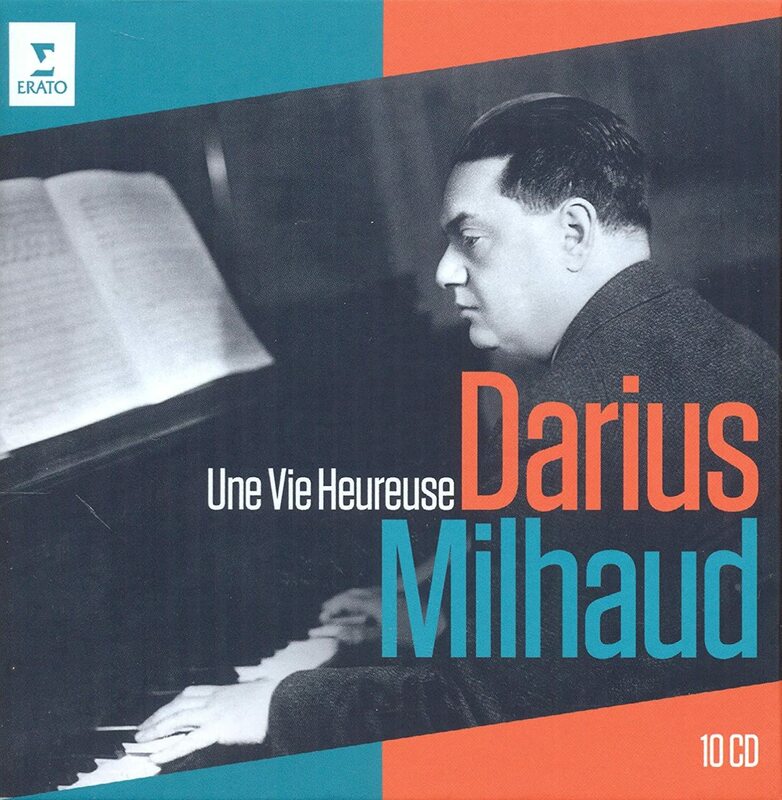 300 fan of Milhaud! It takes some stones to compose in a tonal language during the 1950s. At remove in the Bay Area in California must have made it easier to so no to serialism. I believe it's a mistake to hold Milhaud's prodigious output against him. Some works were taken more seriously than others--you can hear it in his uneven gargantuan output. But there's no doubt to me that he may have spent a disproportionate amout of time and effort on these fine works--perhaps even weeks! They are full of his positive spirit and the upbeat sound, quirky rhythms with identical use of orchestra might account for the similarity amongst the works on a superficial level. i listen to them one at a time...binging diminished returns rapidly. He has a lot of melodies...that can be confusing. As to charges that these works lack depth I take exception. While there's no evidence of prolongation, pitch centricity, augmentation, derived sets or invertability, there are is a heavy emotional gestures expressed in a modern yet gentle manner. The use of rhythmic change as well as tonal surprises sustaines these works. 20th Century "tonality" has no real guidline for the extention of a movement. Changing key makes no constructive implication, the gravity of the cadence is undermined by the surfeit of chord tones. Altering thematic material is difficult since theme groups are no longer so distinct. Stravinsky and Hindemith could do it but there is often high repitition and sometimes a pinch of machanical feeling manipulation. I have said how much I dislike the early polytonal and latin-influensed works...re-"Creation." Many of Milhaud`s well-known works use his earlier style which to me seems a bit "gimmicky," so I never listened to much subsequent work of his. Earlier comments suggest the Symphonies 1-12 are boring. Not to me. I`m glad I found them. 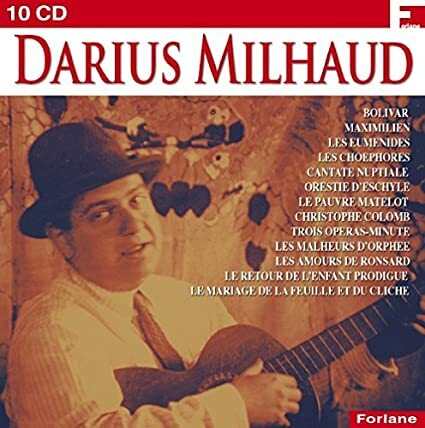 Until a few days ago I hadn't heard a note of Milhaud's music, however I have been listening to some of his music on YouTube and have been quite impressed. I want to buy a few CDs and listen to some more works before I comment further, but first impressions are of a very gentle music, but one that sometimes has a surprising strength to it. I gather that the complete string quartets set is no longer available and it isn't available second hand on Amazon. 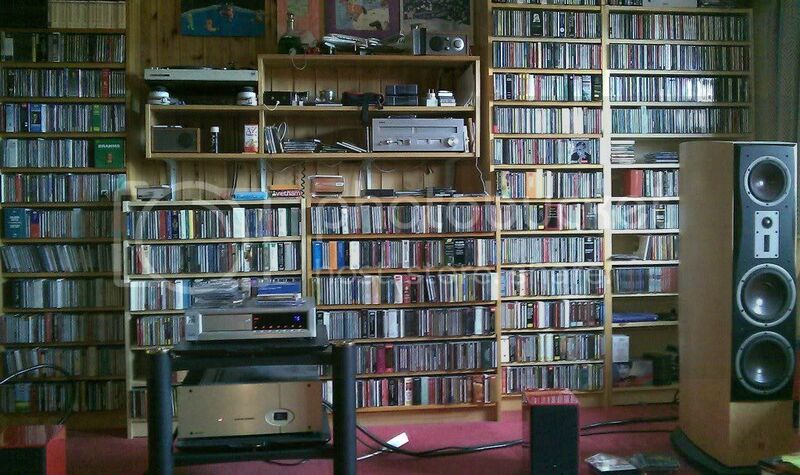 What are good second hand cd sites apart from Amazon (which has always supplied my wants before). Or does anyone have a set they want to sell? I really don't think you want to start with that,... really? Only about 3-4 of those are in a relaxing manner; quirky Milhaud is always around the bend. I always suggest DG Symphonies 1-2 and 6-7 (first), and Erato 4/8. If you want something wilder, the Erato disc of Piano Concertos does the trick. Sorry, should have said I'm listening to the later chamber works ATM, hence my comment about gentle. I think I'll work gradually backwards to the earlier works.